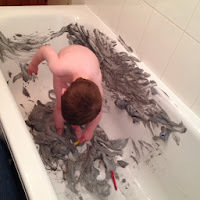 Inspired by Ellie's mummy's frozen messy play on facebook thought I'd create a space foam bath for T.
I sprayed a whole can of shaving foam into the bath, we just use Sainsbury's basics which is 30p then squirted on black paint, using a chopstick I mixed the foam and paint to make a night sky! 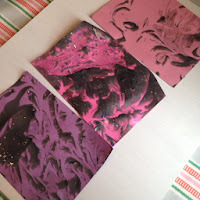 I then squirted on some blue paint and glow in the dark paint, then sprinkled on lots of glitter! It glowed quite well in the dark but not enough to have the lights off for playing! Or to get some decent photos! The first thing we did was place pieces of paper on top of the foam and then put them to one side to dry. T then asked for a paintbrush and he painted the bath with aliens! I love that he actually asked for something to play with. He also used the chopstick to swirl the foam. 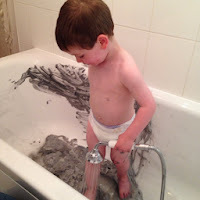 I had expected him to get his hands and feet right in and get covered but he didn't he had no interest in getting covered in foamy paint and wanted it washed off as soon as he got too much on him!! 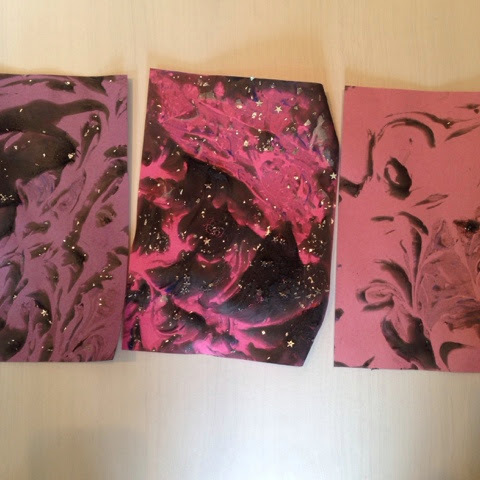 We played for nearly an hour just painting and then spraying it off then painting again!!! 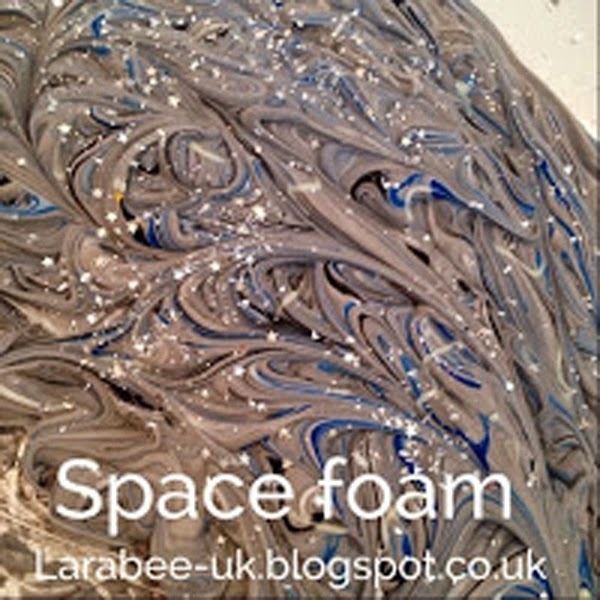 At the end we used the shower adaptor and got rid of all the foamy glitter. There was a slight residue which came right off with some bathroom cleaner and a cloth. Clean-up took minutes! 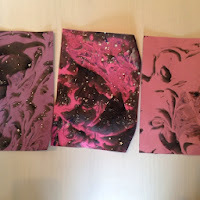 Our pictures looked very pretty once they had dried. 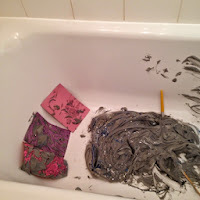 This looks ace, I must remember it, maybe Elsie will enjoy been in the bath as you know its a bit of a fight!